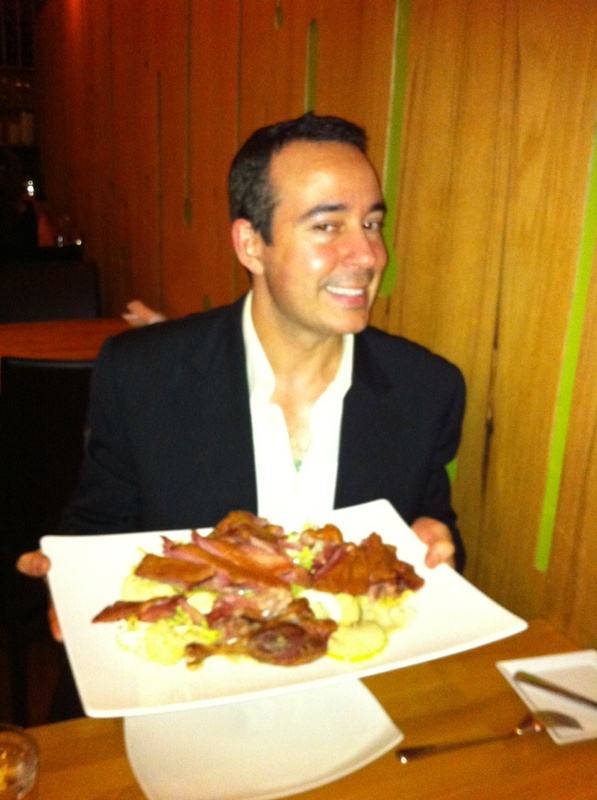 Joseph Mallozzi's Weblog: October 2, 2010: Your Affable Host! Tia Carrere! Marjorie M. Liu! October 2, 2010: Your Affable Host! 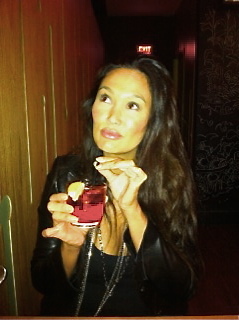 Tia Carrere! Marjorie M. Liu! “Tia Carrere is in the production offices,”producer John G. Lenic informed me. And then added: “She’s stunning.” Seconds later, my Canadian agent, Carl, swung by, Tia in tow. And – damn! – John G. was right. She IS stunning. And absolutely delightful – which didn’t really come as a surprise given that I’d heard nothing but great things about her from people who’d worked with her on Relic Hunter. Anyway, she and Carl were on the lot, pitching a show, and thought they’d drop in to say hello. Well, we ended up hello-ing and then spending a good half hour chatting about her terrific series idea, travel and, of course, food. Turns out Tia is a HUGE fan of duck but, despite her frequent visits to Vancouver, she had yet to enjoy the city’s most awesome duck offering. Tsk, tsk, tsk. I rectified that by taking her to – where else? – Refuel for the – what else? – whole confit crispy duck for two. I always take terrible pictures. This one isn't terrible, thus Tia has proclaimed herself my "best photographer ever"! Hmmm. Does Campari and soda taste like poison? Besides being an accomplished actress, model, and Grammy-winning singer, Tia also happens to be a dessert aficionado. A desert aficionado with a weakness for key lime pie. So after we’d packed away the leftovers (the dogs would be thrilled!) we hopped in my car and headed over to Coast. There we grabbed a seat at the bar and had dessert: the kaffir-lime tart for her, and the tasty but tiny molten banana coconut cake with caramelized banana, coconut creme anglaise with a scoop of vanilla ice cream for me. After we were done, we checked out the lounge. We stepped inside and “Wooohooooooooo!”whooped one of the customers so loudly I assumed she’d just won the lottery. Alas, no lottery win. She’d simply recognized Tia. “We LOOOOVE YOOOOOU!”she shouted and her companions, all smiles, nodded in agreement. For her part, Tia was adorably demure, responding with a shy smile and a big wave before we headed off. A great night. Hopefully, she had no cause regret her decadent outing the next day on her scheduled helicopter ride over the city. 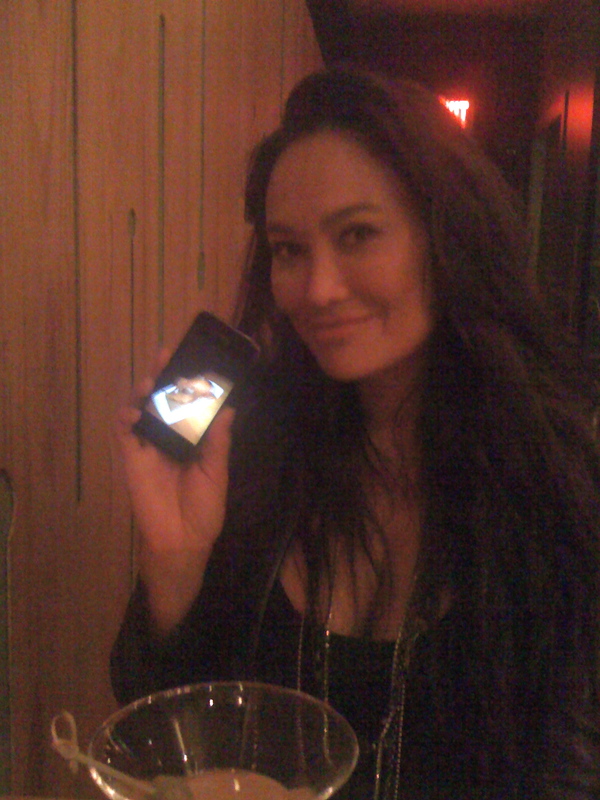 The stunning Tia Carrere showing off a pic of the stunning crispy duck. Speaking of charming company, I had the honor of hosting another lovely guest the following day when author Marjorie M. Liu came to visit. Marjorie, as many of you blog regulars know, is a New York Times best-selling author and comic book writer who I’m lucky enough to be sharing shelf space with in the recently released superhero-themed anthology Masked. Marjorie was in town visiting relatives, so I invited her to come by and say hi. Double desserts! Sticky toffee pudding cake with ice cream and pumpkin pie. She was nice enough to let me have some too. 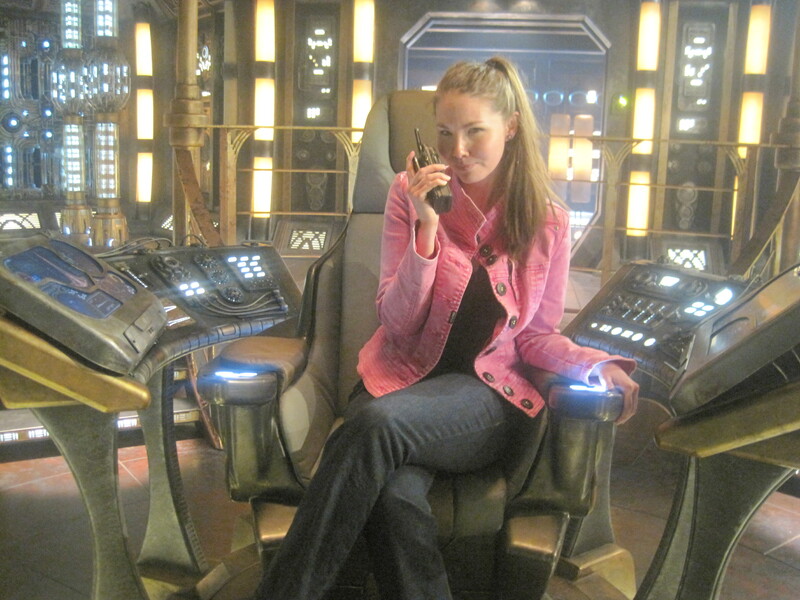 Marjorie drops by the control interface room to correct some of Dr. Rush's calculations. On the bridge ordering shields to full, weapons at ready, and room service milk and cookies. 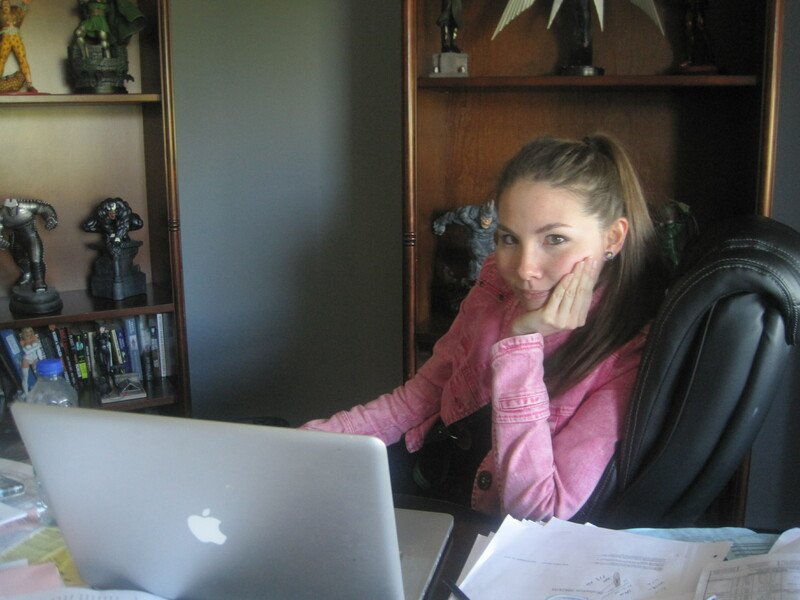 She's conquered novels and comic books. 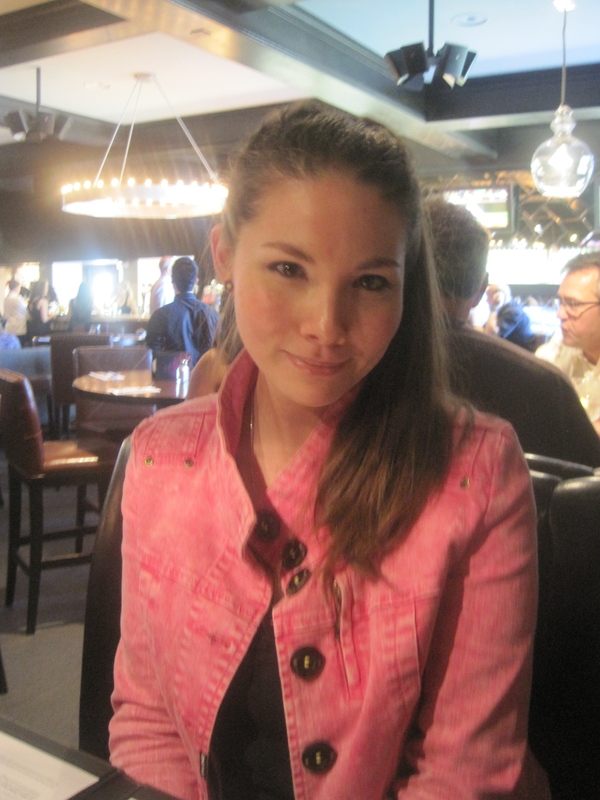 Now, Marjorie M. Liu vanquishes Destiny goulash. Successful, intelligent, well-read, loves desserts, a fan of SF, Fantasy, and comic books AND a total sweetheart! I mean – COME ON! Her visit was all too brief, our conversation ending way too early – even though we’d started talking at lunch and continued, uninterrupted, until I saw her off hours later. Well, hopefully she’ll be back soon – once she comes up for air amid her sea of novels, short stories, and comic books in progress. Previous Article October 1, 2010: Signage envy! Early birthday gifts! A miraculous lunch! And a couple of interesting links! 1) Is there a reason for using an FTL as opposed a regular Hyperdrive on Destiny, does it predate hyperdrive?? 2) I’ve dabbled in making sushi before but have trouble getting a good ratio between rice and ingrediants, is it better to have more or less rice? 3) I know the issue of stargate movies has been debated to death, and then some so instead of making the film direct to dvd, has the idea of turing Extinction and Revolution into a mini-series for syfi been brought up? 4) Was Checkov killed in Sg-1 season 9 finale? 5) Will we eventually see any actual (un)ascended Ancient/Alterans in SGU? Marjorie M. Liu is extremely pretty also. I guess that gorgeous picture of her the other day is what she puts on her books to show what the author looks like. For your future books, are you going to use that one of you and your dog? I’m sure the ladies enjoyed your company too. Gentlemen of style and good manners are an endangered species. Believe me, when a gentleman demonstrates his good graces, it is noticed and appreciated. Too bad good manners are mostly lost on the young of both genders these days, as not many parents appear to be teaching them. Such a shame. Enjoyed the Binder miracle fruit vids. Joe, you have the most awesome friends! I’m sure this is the umpteenth time you’ve been asked this, but does SyFy take into account the massive (and new; it wasn’t there last year) broadcast competition when it’s looking at the ratings for this season of SGU and considering cancellation/renewal? Oh PS has everyone seen John Scalzi’s short story about yogurt taking over the world? Joe, other than the standard envy I have for you in being able to work on an awesome series of shows like SG1, SGA, and SGU, my envy has now risen to new heights. Also well done. You not only got to meet her, but you parlayed that opportunity into dinner and then dessert. Now I’m going to drown my envy in some boring old Lindt truffles. On a side note, I think the ratings will pick up once people realize that the show has shifted nights. I don’t think the change was common knowledge to the average viewer. I’m back for a bit. So much to do, so little time. Organizing a convention is a fair amount of work!!! Really! Anyway, just wondering if you plan to take any precautions against Carl on Monday when he sees what you did to his signage. I hope your group insurance is up to date. What is the difference between FTL and Hyperdrive? You have had Amanda Tapping, Michael Shanks, and RDA on SGU so far, and are filming David Hewlett and Robert Picardo as guests this season. Are there any plans for Joe Flanigan or Chris Judge to appear in the future? Did you ever see David Hewlett in The Cube? If so, what is your opinion of the story? Whatever you did in your former life, it sure looks like it’s paid off. Gorgeous women wandering in, trips to your favorite eateries. And by sharing you are no doubt racking up even more karma points. Hope the dogs enjoy the leftovers(maybe we could get a video of their reaction to the people food? it’s been DAAAYYYSS since we’ve seen the pooches). And enjoy the remainder of the weekend. 7 more hours and I’m finally free for a few days. I figure I will be caught up on my sleep just in time to catch SGU Tuesday night. Is Marjorie electronically-allergic to cats? I hope not. My cat seems to like her. He saw her picture in your blog entry today and he pawed at her face and made a li’l “yeah!” meow sound. p.s.- that’s pretty neat that Tia stopped by. Any hints on what Tia and Carl’s show is about or the basic premise? Carl… as in Carl Binder? Duck… duck noodle soup is my favorite way of eating duck, though without the bones. @ Sean D. – Yeeeah…right. ‘The cat‘ likes her. Uh-huh. Sorry, I’m not buying it, ‘tiger’. Okay, so I just watched the season premier on Hulu, and I’m hoping it’s been long enough that spoiler warnings are unnecessary. I had two big problems with the plotting of this episode. 1) Where is the baby?! Seriously, if the baby’s dead, I want to see a body? If the baby’s missing, then why would everyone be acting like it’s just dead? As it is, it kind of seems to imply that the baby did get taken away by aliens, but that would mean there’d be no body, which would be pretty darn strange to everyone on the ship, not least of all her parents. 2) I feel like we were just supposed to assume that somehow the Lucien people communicated to SGC that they needed doctors because they’ve taken over the ship. I think this really ought to have been explained more clearly. I’m imagining it either being one of their people or one of the SG people being sent to SGC via the stones, telling them in some way that they needed four doctors because the ship had been taken over and there were wounded. The SGC would then know that the Lucien Alliance had taken over the ship, killed and wounded their people, and were holding everyone else hostage unless they got their way. I really don’t see the SGC (and especially O’Neill, if he’s still in command there) just going, “Oh, well, we’ll naturally comply with your demands immediately, even though we have no assurance whatsoever that anything good will come of this–in fact, we won’t even ask for such assurance.” That really doesn’t seem like the SGC’s style, much less O’Neill’s. Why were the four doctors not also secretly military people who would help get the ship back? Or at least something remotely useful to taking back the ship? Big, big plot hole that relies heavily on known entities acting wildly out of character, in my view. :p dasndanger… seriously, the cat actually did that. So, does reading your blog let some of those good karma brownie points rub off? I’m not even a guy and I’m incredibly envious of your life. I mean, Tia!? Swoon. And Marjorie, well, I don’t dare let my hubby peak at her, he’d migrate. The most exciting thing I’ve done this week is switch out the spring silk flowers for the autumn silk flowers in the big hibachi in the parlor. Yes, I have a parlor. No, I do not use the hibachi in the manner for which it was created. Yes, it was full of charcoal and ashes when I rescued it from the tumbledown house down the block from my place in Shioiri. No, I don’t have summer silk flowers. That would be obsessive and a little too Martha. Sigh, I am so pathetic some days. Salut Joseph, J’ai vu que tu comprenais le français, alors je t’écrit. J’aimerai savoir si après les audiences assez moyennes de Mardi dernier, tu pensais toujours que SGU ira jusqu’à une saison 5 comme tu nous l’avais dit ? En tout cas nous sommes beaucoup à l’espérer vivement ! On veut savoir la suite de cette formidable aventure. Merci pour ce que tu fait pour la série, en espérant que tu puisses répondre. 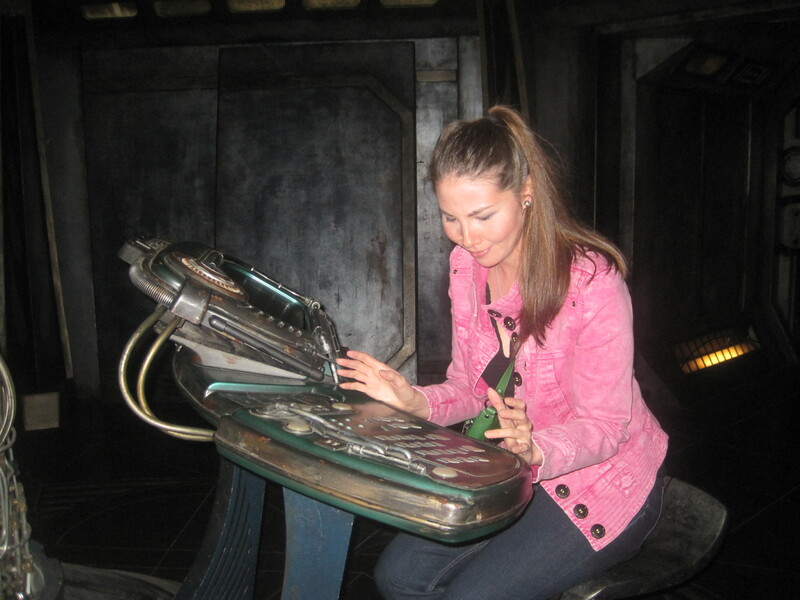 Yeah, no kidding Thornyrose – surrounded by the hawt wimmens, enjoying good food, a dream job of working on Stargate – Joe, I hope you’re counting your blessings! And yes, we need some dog updates! How is Jelly coming along? Well, I hope. You are the luckiest man alive joseph mallozzi, you get two smoking babes in two days and I get one every 10 years. Did you ask Marjorie M. Liu for undersea science fiction recommendations? Dazzling picture of Marjorie on the bridge. Ask John Scalzi if he knows anyone who can make it into a black velvet painting. Joe, any chance you guys would ever do a contest where indie filmmakers could write a script set on Destiny, and the best one (picked by the SGU writers) gets to visit the Destiny set and shoot their short film? Cause I think that would be the most amazing contest ever. This is how it starts. First, they sneak you into a book with them, then they steal your job. Hope you guys do well with Masked, I’ve given up on Superhero Comics, beyond Invincible and Powers of course. I prefer Naruto and Bleach. Gantz and Shigurui are also very good. So I’m reading those as well. It’ll be interesting to see the bridge, but you creative guys need to throw more tidbits on Youtube. It’s so easy to get fans salivating. Just throw clips of the bridge and other components on Youtube. Up close and personal like. I’m gonna try and build Destiny out of minecraft blocks. I’ve seen Enterprise and Daedalus on youtube. I wanted to build Atlantis, but seeing as how its about eight miles all around, that idea died a slow agonizing death. But I think i can do Destiny. Note I’ve just started, and my attempt at being an attention whore, would work better if I was able to build the destiny out of blocks on minecraft. Though it’ll take hundreds of hours of time I don’t have, the attention it may give me far outweighs feelings of how actually sad my life is. You guys need to bring more stargate material to youtube. I just got back from a quick trip to Nashville, TN. Saw some old friends, drank too much wine and sampled some great food. I kept wondering why I hadn’t moved back into that area. Then I got stuck in the traffic…. Love Nashville, hate the traffic . Both hubby and I loved SGU tuesday! Interesting Tia Carrere news. Someone should of asked her what happened with Relic Hunter. It kinda er ended after the 3 initial seasons they were contracted for..
Tia Carrere and Marjorie M. Liu? I have a message for you from The Devil, he says “you’re welcome” and he’s going to take good care of that soul he recently purchased from you. You got dinner with Tia and lunch with Marjorie, while poor Charlie Daniels only got that lousy fiddle. Seriously not only did you have the lovely, smart and charming Tia as a dinner companion, but you spent the day with Marjorie who’s smart, charming and lovely; awesomness all around! Tia was rocking on Warehouse 13, I look forward to hearing more about her show. Why is the vegan food so horrid? Next time why not do potluck and challenge attendees to make the best vegan meal ever. And don’t be like my sister and serve delicious collard greens while not confessing to having used hog jowls in the sauce.